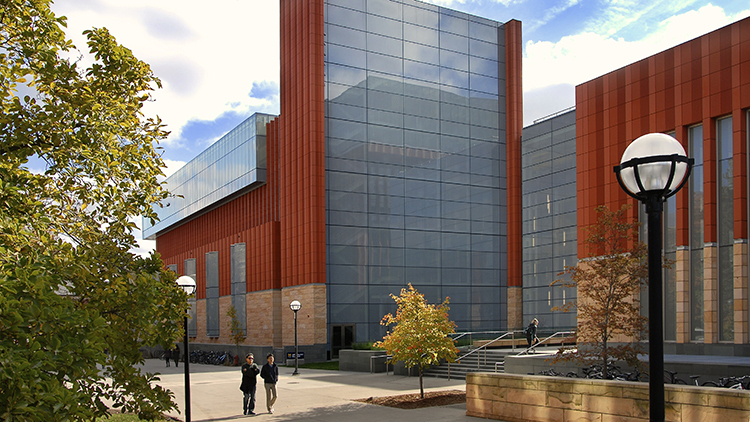 The buildings that comprise the Stephen M. Ross School of Business at the University of Michigan are stunning, with their airy ceilings, tall windows, shiny floors, and silver fixtures. But these beautiful structures are more than just the home of the next generation of business leaders—they’re also environmentally friendly. 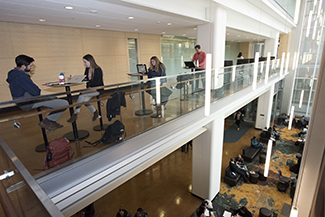 Kresge Hall and the Jeff T. Blau Hall recently earned LEED Gold certification for the construction and renovations that began in April 2014 and finished this summer. Here are some of the state-of-the-art upgrades you may have noticed — and others that work quietly behind the scenes. New bathroom fixtures reduce wasted water, said Michele Christensen, sustainability coordinator for the University of Michigan. The fixtures aim for a water use rate that’s 41 percent better than the standard set by the most recent Michigan plumbing code. A smart irrigation management system also reduces water use by 56 percent when compared to previous years, Christensen said. Have you ever seen automatic sprinklers at work when it’s raining outside, or sprinklers watering sidewalks? The new system makes sure that doesn’t happen by taking into account weather patterns — so if it’s been raining for two days, the system knows to cancel regularly scheduled watering. Ross students working on two levels of the new Blau/Kresge buildings. 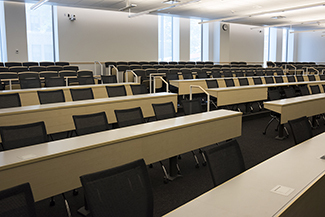 A state-of-the-art classroom in the new Blau hall. An 86 percent reduction in water runoff is another huge benefit of this project, Christensen explained. Too much runoff means that areas are more prone to flooding. A new stormwater retention system under Monroe mall also allows the ground to absorb water gradually. 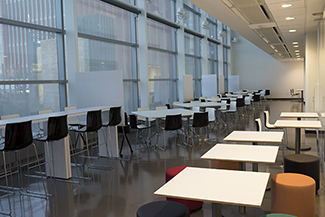 Task lighting, efficient light fixtures, and the integration of natural daylight helps reduce the electrical load of Kresge and Blau. Occupancy sensors turn off lights when spaces are unoccupied, and new air systems track occupancy so empty rooms aren’t heated or cooled. Renovation projects can create a lot of waste. 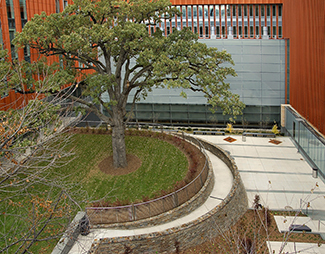 But with this renovation and building project, 87 percent of the on-site generated construction and demolition waste was diverted from the landfill. More than 37 percent of the total building material’s content, by value, was manufactured by using recycled materials. And nearly 70 percent of the total building material’s content was manufactured and extracted within 500 miles of the project site.